Aoléon and Gilbert investigate the Luminon to try and uncover the plot to invade Earth to steal it’s milk cows. In the process, they discover a disturbing revelation about the Martian leader. After overhearing the Luminon discuss his plans to use sabotage to disrupt Mars’s galact supply, the duo races to try and to warn Aoléon’s father Deimos, who is a manager at the galactworks plant before the saboteur can act. Meanwhile, Aoleon has to take her pilots exam, which would enable her to eventually join the Martian intergalactic explorational fleet. However, during the test-run, something goes horribly wrong. The two are put in a life threatening situation that only Bizwat, a Procyon commando, and Aoléon’s friend can save them from. Gilbert finally gets his chance to learn to skyboard. However, things go horribly wrong and they are chased by the Royal Paladin guard. 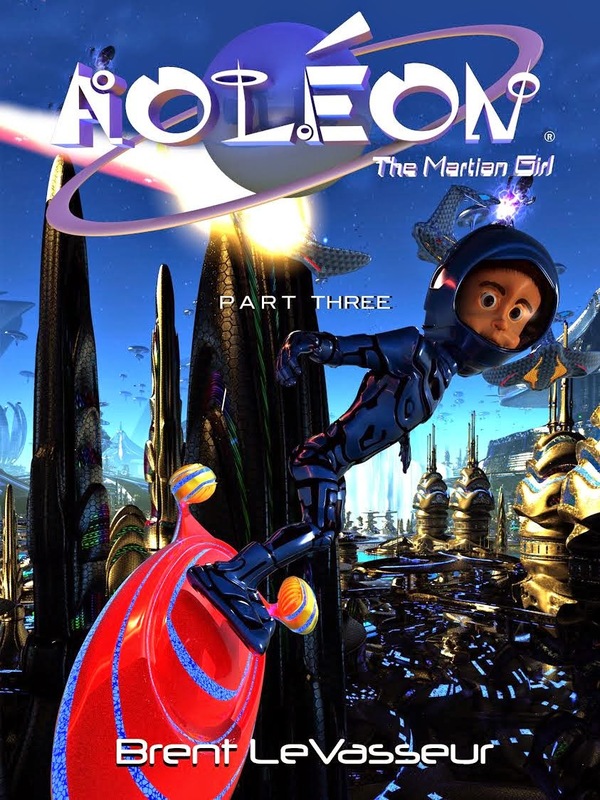 Join Aoleon and Gilbert in this exciting middle-grade scifi adventure story to Mars and beyond! I may be running out of words to describe just how fun and wonderful this series is. In part 3, Brent doesn't let the reader down but keeps the adventures coming. The pacing is still nice and quick so as not to lose the younger readers but the imagination is still top notch! The illustrations will still capture that same imagination and before you know it, you'll be eagerly looking for part four. Luckily for me, I already have it and it's time to get reading it!